To hear certain people in Silicon Valley tell it, cash is teetering on the edge of obsolescence. In the not-too-distant future, the theory goes, we're going to pay for everything with our cell phones--and it'll be quicker, smarter and safer than using paper money or plastic. There are already several ways to do this. The most widely accepted one, Google Wallet, requires you to have a special chip in your phone (now on only a handful of Android models). 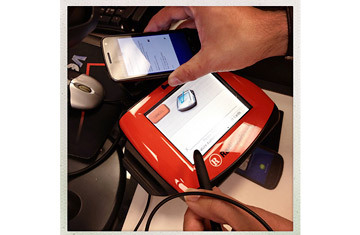 You pay by tapping your phone on a credit-card reader equipped with near-field communication (NFC) technology. At best, it's no easier than swiping a card. Another is Square's Pay with Square app, accepted mostly at mom-and-pop shops but heading to 7,000 Starbucks locations this fall. Unlike Google Wallet, it's compatible with the iPhone and a bevy of Android models. And it lets you pay without removing your phone from your pocket. The app communicates wirelessly with the tablet or phone the merchant uses to accept payment; the cashier IDs you by checking your name and photo. Both systems are at least as safe as paying with plastic and can be remotely disabled if your phone is stolen or lost. Under most banks' policies, the consumer isn't liable for unauthorized charges. So what's it like to go cashless and pay by phone? To find out, I woke up one recent Monday and ceremonially stuck my wallet in my sock drawer. My plan: to spend a week around San Francisco making purchases exclusively via Google Wallet and Pay with Square. I managed to make it through seven days without cheating, unless you count mooching off my wife. But there were enough glitches--at one point Google Wallet stopped working altogether--that I was glad to get my wallet back. Here's a look at my week.